Deciding to put his life of crime behind him, Doug MacRay sets out to pull one last job and leave Charlestown forever. However, between maintaining his new relationship with Claire and keeping his loose cannon buddy, James in check, leaving may not be as easy as he would like. 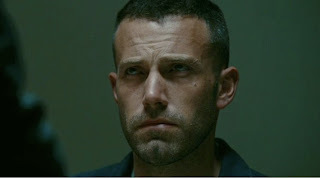 "The Town" marks Ben Affleck's second directorial effort and after proving himself with some serious chops on "Gone Baby Gone", this was going to make or break him as a director. Fortunately, "The Town" delivers on all counts. Do you remember Apple's old slogan "it just works"? That is exactly how I felt about "The Town". This is a film that tells a bank robbery story just like every other bank robbery story, but is so well crafted that you cannot help but submit to its tale. Almost all of what makes this film work the way it does lies in the performances and everyone is at the top of their game. While the entire cast is absolutely phenomenal, Jeremy Renner is a show stealer who turns in a performance worthy of a supporting actor nod come awards season and almost certainly solidifies him a spot as a new "it" guy in Hollywood. Mr. Affleck himself turns in his best performance since his Kevin Smith days, though he's a bit too broody (I swear I felt it through the masks) and Jon Hamm does well with what he was given, but his part is fairly miniscule in the grand scheme of things. The action and cinematography in "The Town" pick up exactly where "Gone Baby Gone" left off and left me just as impressed. Ben Affleck is one of the most effective directors working today and while his films might be leaving something to be desired visually, at least we know what is going on during the action sequences and who is where at what time. The film's two hour plus runtime flew by and I could not believe we had actually been in a theater that long. Making a bank heist thriller in a post-"Heat" world is risky and yet, "The Town" remains a totally separate film on all levels. This absolutely the best decision Affleck could have made and it helps the film to stand up and out from the rest of the films in this genre. That is not to say the story is wholly original, but it is presented to us in such a quality package that one cannot help to look at it and be left totally satisfied by the fade to black.